I’ve spent the last 3 weeks road testing the ‘all-new’ 2018 Specialized S-Works SL6 Tarmac. In this review I will detail the significant changes in the geometry of this all new Tarmac and describe what impact a lighter and more aerodynamic bike has on overall ride quality. 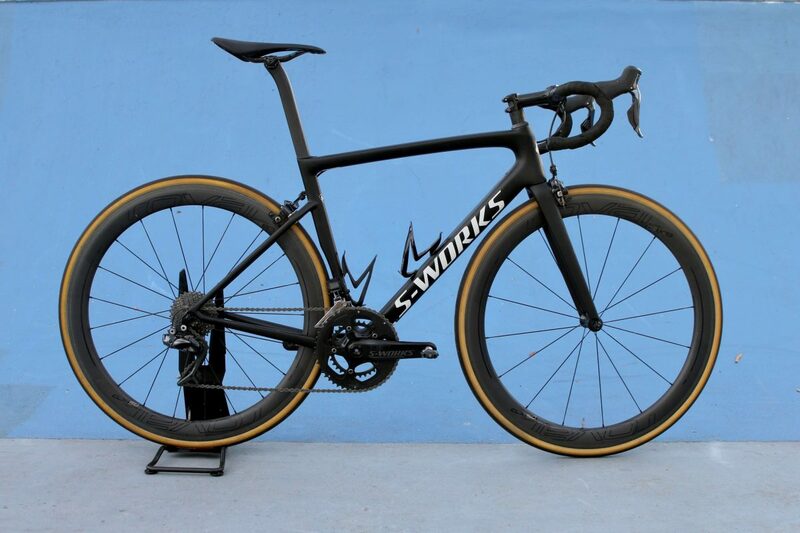 Additionally, I will provide an intimate comparison to the now older Specialized Tarmac SL5 model. 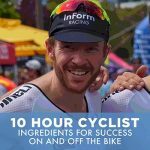 Video edited by Cycling Maven. But firstly, I’d like to describe a little Tarmac story for you. Over the course of my last 10 years of road riding I’ve dabbled with many brands. The constant, however, is that I’ve always chosen the performance bike within the fleet, whether that be a BMC SLR01, Giant TCR or a Scott Addict. Blending different branded road bikes in-between the older Tarmac SL4 and the very first engineered Specialized Venge, I ultimately ended up back on the Specialized S-Works Tarmac SL5 in 2014, where I’ve stayed put since. Over the last 3 years I’ve ridden three different coloured Tarmac SL5’s via the InForm Tineli team. As Specialized maintain geometries for 3 years, the only exciting aspects to new bike day have been colour and components. So as you can imagine, after 3 years of essentially riding the same bike, I was eager to throw my leg over this new SL6. Although having said that, way back in 2012 I had been on the SL4 model, and while the changes from the SL4 to the SL5 were evident, it was no overhaul. With all the media and hype about the all new Tarmac this year, I did ponder: is everyone getting a little bit carried away here? Given my experience of moving from the SL4 to the SL5, I did think that this might just be another Tarmac with some slight changes. On the left you can see the all new 2018 SL6 and the SL5 on the right. You can see on the SL6 a new fork design, direct mount brakes, more aero tubing, particularly in the seat tube, and dropped seat stays with a D shaped seat post. 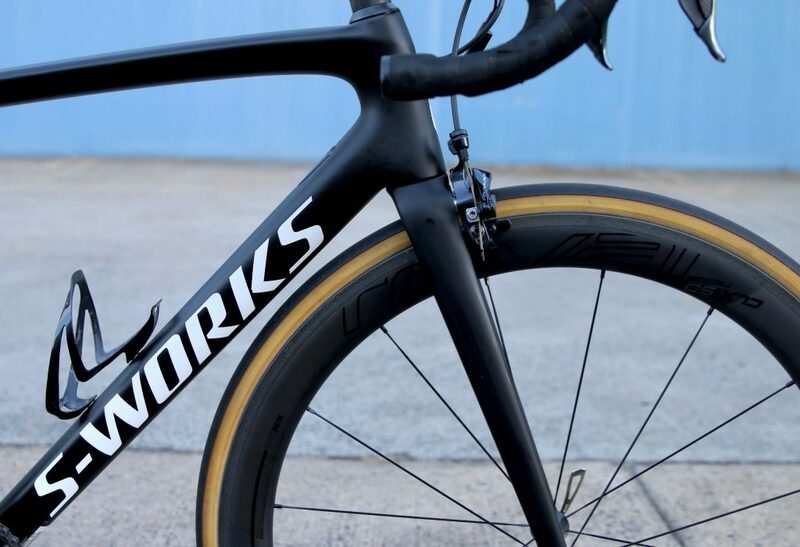 Find the 2018 S-Works Tarmac SL6 and other bikes for sale in Melbourne on Bike Chaser. When bike brands upgrade their performance bikes, we do hear the same old story a lot. It’s ‘more aerodynamic’, it’s ‘lighter’, it’s ‘stiffer and faster’…the list goes on. While that’s great to hear because – let’s face it – we do love hearing those features articulated out loud, the waters have been muddied over the years. Outside of the brand name it’s become difficult to delineate between one carbon race bike to the next. Specialized have been in partnership with Retul since 2012. Thus, they have jointly analysed over 40,000 fits using digital technology over the past 5-or-so years. A massive asset of analytical data they haven’t had for previous Tarmac iterations. At the time when Specialized were modelling the Tarmac SL5, they would have had very limited bike fit data from Retul. If the first SL5 went to market in 2014, they probably would have already developed all the tweaks from the SL4 to SL5 around about the same time their formal partnership with Retul was launched. Fast-forward to developing the SL6, and Specialized have thousands of analytical reports from fits across both men and women. While they continue to seek feedback from their performance athletes, such as Peter Sagan, they’ve always had that channel as part of their process for developing new technologies. The Retul fit data, however, is the game changer. A game changer that has led Specialized to recognise that there’s actually no need to have men and women race different performance frames i.e. the Tarmac and the Amira. This has enabled them to focus all their energy and time into one race performance machine. Additionally, this Tarmac isn’t really an iteration of the SL5, where they’ve made few tweaks here and there. This is a fully re-engineered race machine with some profound improvements in ride quality. The all new Specialized S-works tarmac is now a shared platform for both men and women at a race performance level. 40,000+ bike fits captured digitally via Retul is the reason why. There’s a lot less bike, so what’s the impact? Before I even got onto the all new Tarmac I was taken back by the size of the frame. There’s a lot less of it, 200 grams in fact, when you compare it to the SL5. This tarmac is thinner, narrower, and lighter. While that’s great news for accelerating, going fast in a straight line, and motoring up a hill, I did wonder what impact these changes might have on say handling stiffness and comfort. Specialized apparently discovered three areas where they could add aero without compromise — a new fork shape, dropped seat stays with aero tubes and a D-shaped seat post and seat tube. According to Specialized the new Tarmac is approximately 45 seconds faster over 40 kilometers compared to other lightweight bikes in the same weight category. After staring at my old SL5 and the SL6 for hours, pondering how I would test the claims Specialized have made, in addition to assessing my own concerns surrounding what impact a lighter and more aerodynamic frame might have – I rolled down my driveway and started to build a picture in my head. 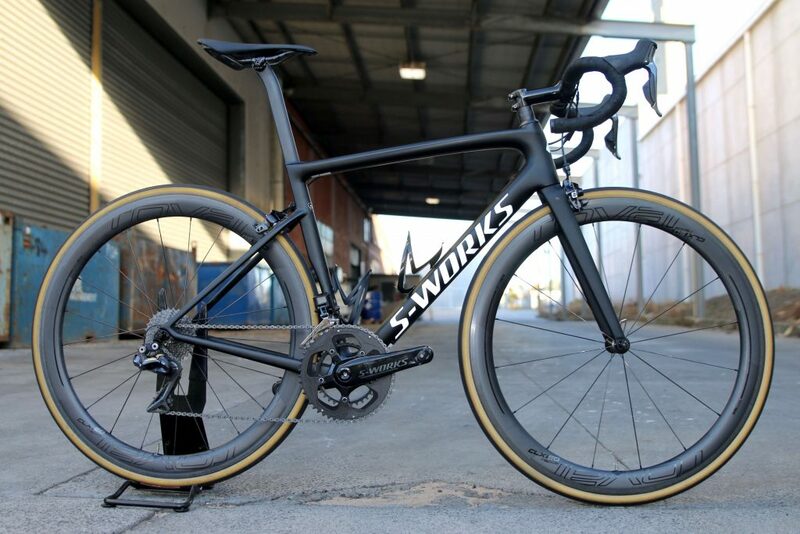 Specialized claim that the all new Tarmac is more aerodynamic than the first built Venge. I rode the first built Venge for over 12 months, so I can confirm that this statement seems to be true. While rolling down your driveway should not be the clincher for any road bike test or review, it’s become a major first impression for me. Reason being, it doesn’t matter which way I turn to ride, I always roll down my driveway. It’s a constant. The roll down the driveway involves no pedalling, a slight bump where the driveway meets the road, and a turn – either left or right. The bike does all the work and I get to feel how it rolls unassisted; how it absorbs a bump that I’m all too familiar with, and lastly how it corners without speed involved. I knew only moments after leaving the house, that this all new Tarmac from Specialized, really was ‘all new’. Bunch riding – I was constantly feathering the breaks because the bike was gliding like never before. I’ve literally had to reinvent my pedal stroke to apply less power as I sit behind the wheel in front of me. Rolling turns – When I hit the front of the turning bunch I notably felt less impact from the wind, swapping off with less force required through the pedal. Downhill – The bike’s ability to rapidly generate speed on a descent was perhaps the most pronounced impact above all else. I sometimes ride in a large Saturday morning ride where you’ll come down a steep hill on the way back to the finish. For the first time since I can remember, I was so rapidly generating speed that I was on the brakes to mitigate any close encounters with riders descending the hill in front of me. In addition to the above, the cornering aptitude has also improved. I actually found myself over cooking a number of downhill corners I would normally take with ease. The rapid speed of decent and the bike’s cornering prowess, make this a tantalising prospect for any downhill dare devil or serious road racer. The complete package with the new CLX 50 Roval wheels is an eye-catching package. What’s happened to comfort & handling performance? I need to be clear – I was looking hard for reductions in comfort and handling stiffness. I was immediately critical, before even riding the bike. I recall riding the Venge a number of years ago. Yes, it was super fast, but it was also uncomfortable. 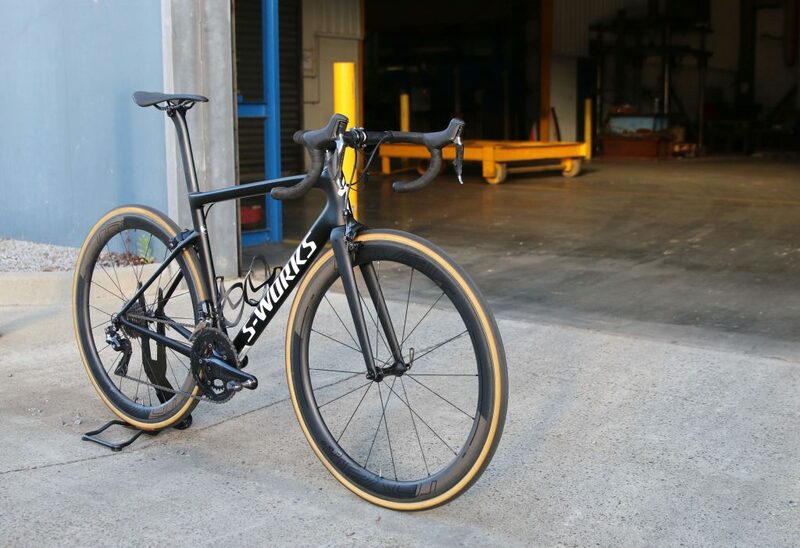 Specialized have created a bike that is more aero than the original Venge and is lighter than any other frame that has rolled off their production line. This bike just had to be uncomfortable, and perhaps a little flimsy, I was assuming. Particularly given the massive weight reduction. I’m still finding it hard to fathom, or even write this down, but I was proven wrong – in quite a big way. This bike is actually more comfortable than it’s predecessor, the SL5, and the handling performance is another level above. Firstly, there’s been an upgrade in the quality of carbon fibre used, from FACT 11r to FACT 12r. Without going too technical, instead of using 300 engineered carbon pieces with a FACT 11r frame, Specialized now use 500 pieces. Thus, you can make a smaller frame stronger, stiffer and more compliant. Secondly, taking a ‘rider first’ approach, Specialized have created three separate forks. They’re all the same design but the steer tube tapers differently and the legs have different dimensions depending on the frame size. Ultimately, this creates a more bespoke geometry for riders of different sizes. Taking their ‘rider first’ approach further, Specialized have recreated their Tarmac front fork and developed three versions depending on frame size – meaning consistency in handling performance across all frame sizes. Thirdly, the previous SL5 Tarmac had a standard seat posts with a generic/non-specific layup. A new non-uniform layup design is now used, which features a strong and stiff section where it enters the frame, but an extraordinarily compliant section near the saddle. This creates more comfort in the rear for the rider. 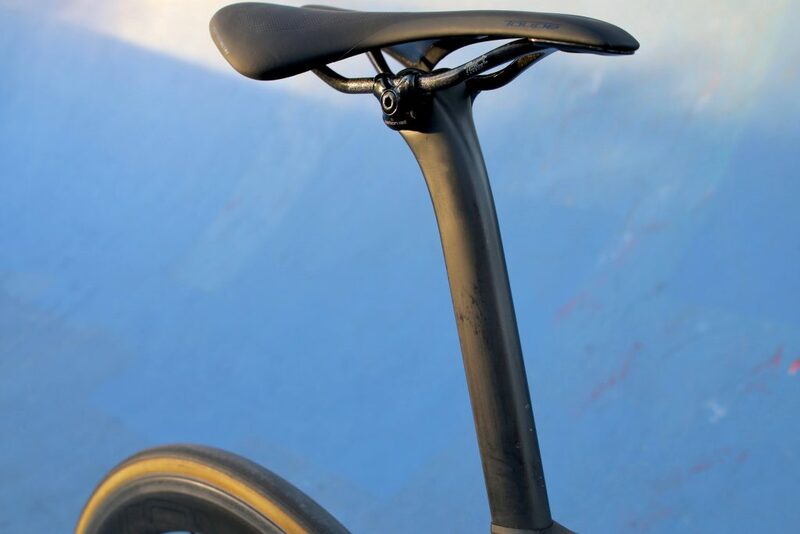 The new D shaped seat post is not only more aerodynamic but its non-standardised layup enables more compliance at the top end of the post, towards the seat. From a personal perspective, I loved the new Roval CLX 50 wheels that come with this Tarmac. 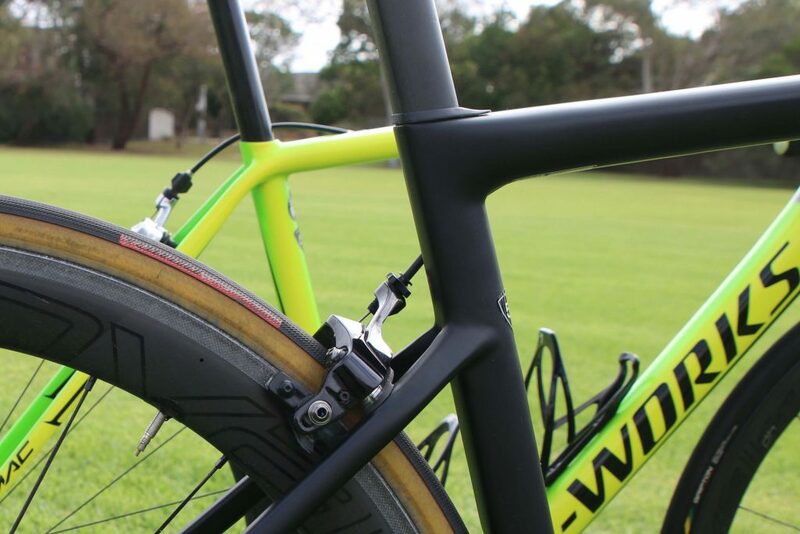 These 50 mm wide-rimmed carbon clinchers really add another aero dimension to this bike. I’ve ridden the 32’s for 3 years now and the CLX 64’s on the old Venge. While they’re a good robust carbon clincher, riding the CLX 50 Rovals has been the first time I’ve gotten a little excited and carried away with the feel and speed for a Roval wheel. While the Roval CLX 32’s come stock on the Tamarc ‘Ultra-light’, which also sports a 10 gram paint job to bring down the weight, I’d recommend the CLX 50’s any day of the week. Yes, they’ll blow around a little more in major cross winds, but if you’re not planning on riding or racing often (where there’s wind gusts of over 40 km per hour), these wheels offer more speed, and in my mind are more aesthetically pleasing to the bike. The rim weight on the 50’s clinchers is 1,375 grams vs. 1,280 on the 32’s which isn’t going make much difference – if any – in acceleration, and will add to the glide sensation you get with this aerodynamic frame. 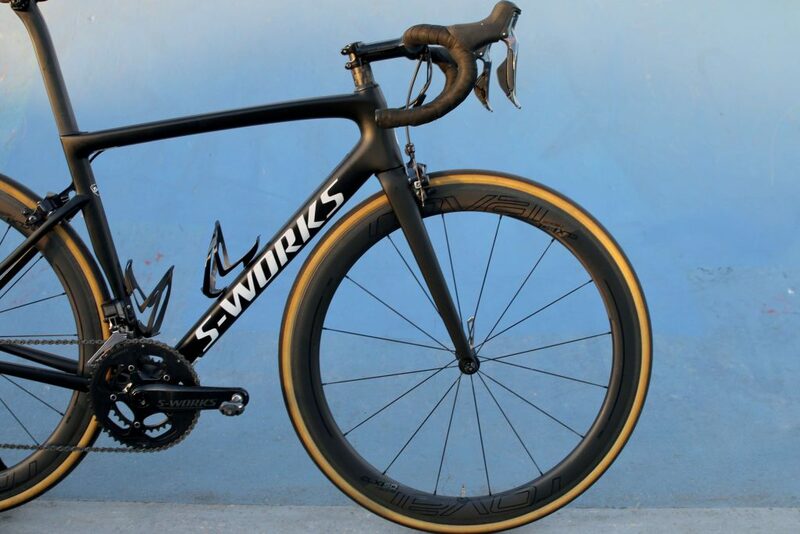 This 2018 Specialised S-Works Tarmac comes with 11 speed Shimano Dura-Ace Di2 and a set of their new Roval CLX 50 carbon clinchers. Additionally, the all new Tarmac comes with Shimano Dura-Ace 11 speed Di2, which now cables even more seamlessly through the frame and offers their charging unit for adjusting gears where the left handle bar cap would typically be placed. The Shimano Dura-Ace ‘9110F’ direct mount brakes enable a greater tyre clearance of up to 30 mm (vs. 28 mm, on the previous SL5 model) and greater breaking power. 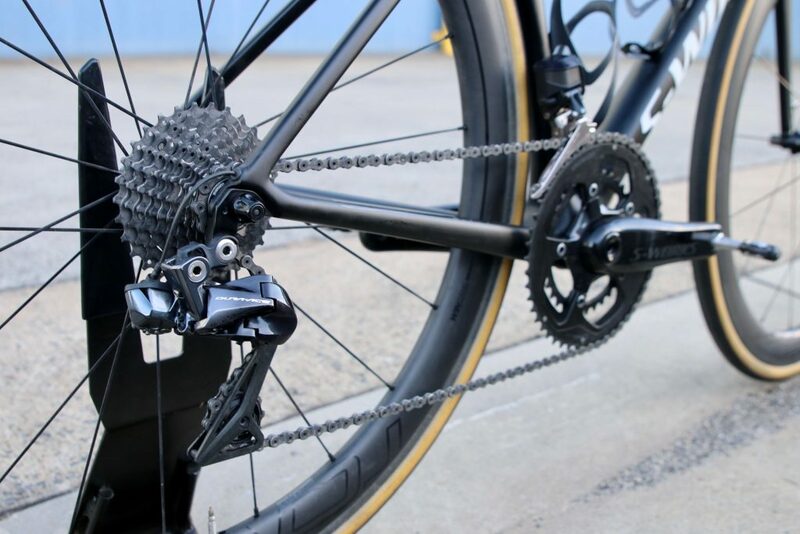 The drivetrain offers Dura-Ace 11 speed, OSBB ceramic speed bearings, 52/36T chainrings and an 11 speed 11/30 rear cassette. The cockpit is all S-Works. Dura-Ace 11 speed Di2 shifting is another solid feature to at the list. For full tech specs see here. Overall, in my mind, this bike has defied the odds – especially when I compare it to the previous Tarmac S-Works SL5, which was an elite racing machine in its own right. This all new Tarmac accelerates faster, glides through the wind with more precision, corners with eloquent aggression, while its climbing prowess continues to rise. All of this, while improving handling performance and comfort. While this bike has truly exceeded my expectations, it’s important to recognise that this is a performance bike. While comfort has been improved, its geometry is aggressive and its capabilities have been built to help professionals like Peter Sagan win stages at the Tour de France. If your riding style is road but perhaps more relaxed, i.e. cruising at 25-35 km per hour with no desire to beat your mates around the block, then perhaps a Roubaix could be more your style. It provides more of a relaxed geometry and takes a way a lot of the shock you get on the road while also offering a compelling level of ‘race performance’. Check out Bike Chaser’s range of Specialized road bikes. The Peaks Challenge – What Not to Do! Quality review and video. I’ve also been riding the SL5 for 2 years and wasn’t sure about upgrading or not. I think you’ve just sold me. Thanks Sam, appreciate the comment. Enjoy the SL6! Tested this bike today and I was amazed by the responsiveness in pedal power and acceleration. Hi Tony, thanks for the comment and a little envious of your purchase! Can you send us a nice picture of the Sagan version you bought? We’ll put it on our Instagram account and tag you. Please email me at cameron@bikechaser.com.au if you’re up for it. 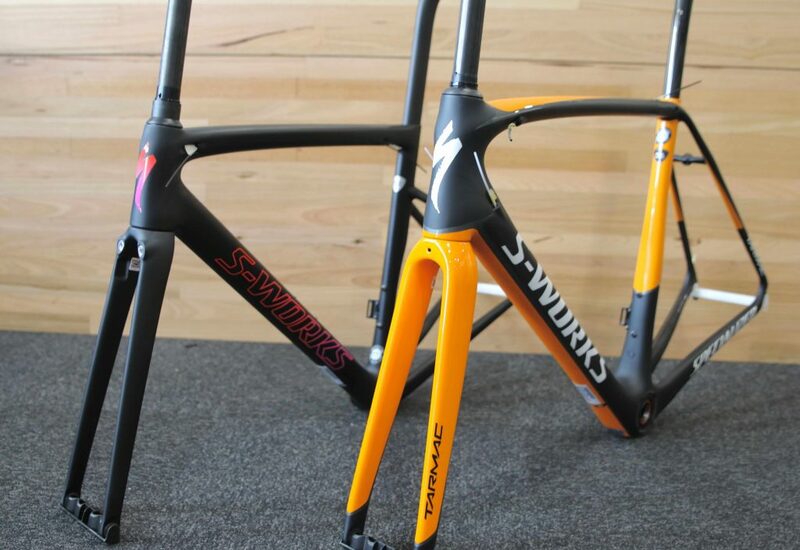 If you were purchasing a new bike what would be your deciding factor between the new s-works Tarmac and the Pro Venge? Wats the weght difgerence between the Frame of 2017 tarmack and 2018 ?